Never in a million years would I have expected a Facebook post to change my life in such a profound way. In January 2014, a high school friend posted a story from her local paper in Richmond, VA, about her doctor, who was driving drunk TO work one morning when he hit and killed a runner. Meg Menzies. Someone I didn’t know, had no idea even existed…at the time. She was out running with her husband, training for the Boston Marathon. Meg apparently was a really good runner. She was also a wife and a mother to three young children. She was also younger than I was. And her life was cut short by the bad decision making of a man she didn’t know. She basically passed away with her husband Scott standing helpless next to her. Her children suddenly were without a mother. Her husband lost the love of his life. I have always been very outspoken against drinking and driving. In college, I was almost always designated driver, even giving my roommate a piece of paper with my number on it (just in case she was too drunk to remember it) and a quarter to call from a pay phone (yes, this was in the mid-90’s, before cell phones, when there were still pay phones around). So of course I was sad to hear about such a reckless act that resulted in tragedy. But for some reason, this story touched me in a way I never imagined. 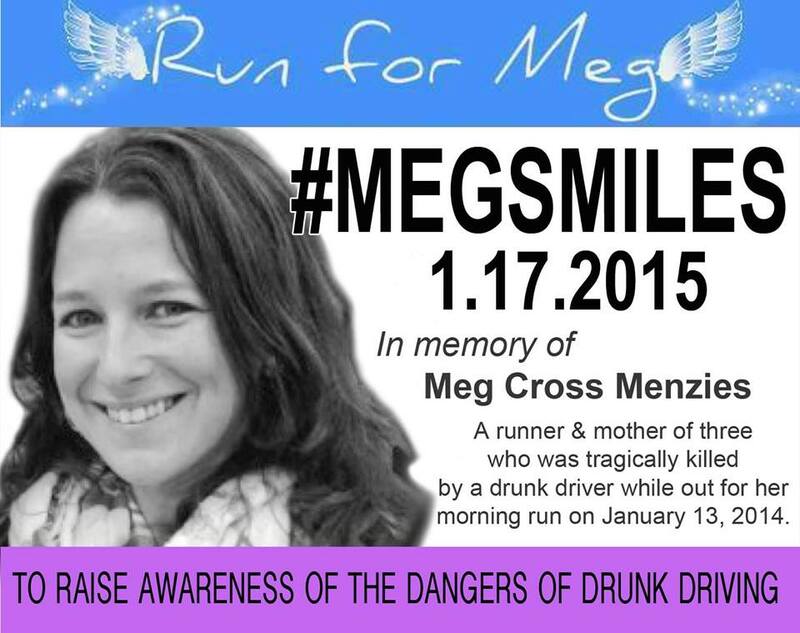 A Facebook group sprung up, organized by Meg’s friends, asking people to run in memory of Meg that weekend. I signed up and ran three miles on the treadmill. What I didn’t realize was that I was one of literally TENS OF THOUSANDS of people around the world to run for Meg that weekend. And thus the Megs Miles movement was born. 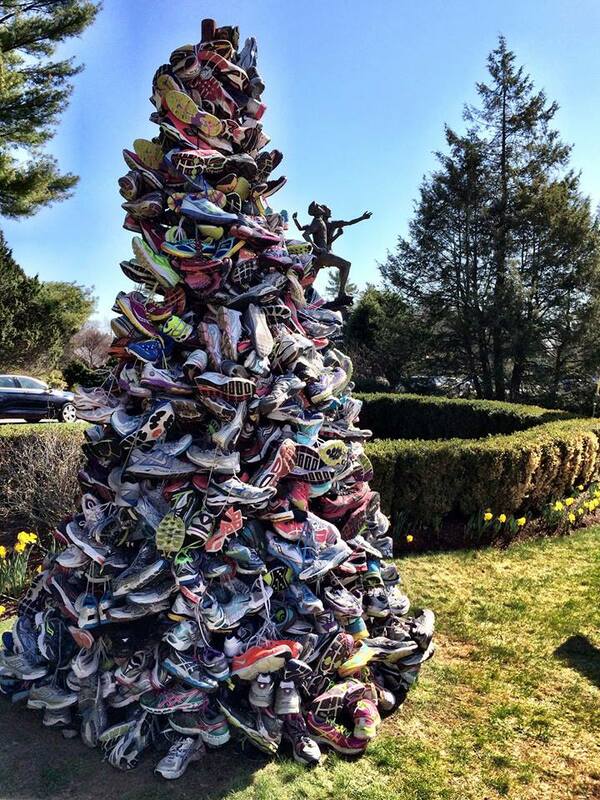 In short order, a memorial was started at the site of Meg’s death: a shoe memorial in Ashland, VA, where runners place their shoes. I am excited and sad to be planning a visit to this site in May. The image to the left is a recreation of the memorial from the 2014 Boston Marathon, where a Meg’s Miles member collected running shoes and erected a shoe memorial at mile 1 of the race for Meg. One can only wonder what Scott felt as he ran by this memorial, when he ran in Meg’s place in that journey. So it really has been this Megs Miles group that has taken me under its wing and helped me to become a runner. I interact with these folks regularly on Facebook. I have met one of them in Bermuda at the Bermuda half marathon in January 2015. I will be meeting some more of them when I visit Meg’s memorial in Ashland, VA, when I am in the area this May. I appreciate everything they have done to get me involved in this sport, all the encouragement they provide when I need it, and especially the opportunity to offer my encouragement and prayers for others who need it. Love this. So many folks impacted in unimaginable ways. Glad folks like you are willing to share so we get just a glimpse into those ways. Keith, the Megs Miles group has been an unbelievable blessing in my life. I get lonely here in Cayman and I do find that interaction on social media helps me to feel part of a greater community. And to be a part of the community that is dedicated to being the good, well, sign me up! Thank you for your continued inspiration and support. I can’t wait to meet you in a couple weeks!